Mother Teresa was born on August 26, 1910, in Skopje, Macedonia, now a part of Yugoslovia. Her original name was Agnes Gonxha. When she became a nun, she adopted the name of a saint she admired. 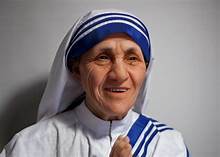 She named herself Teresa after St. Therece, a 19th century French nun honoured by the Catholics for her remarkable courage during a long and painful terminal illness. The parents of Agnes were Drana and Nikola Bojaxhiu. They were both strict and compassionate. Agnes adored her father. But her father died when she was only eight. This was a major turning point in the life Agnes. Agnes was only 12 years old when she first though of becoming a run and devoting her life to the church. Father Jambrekovich helped direct her decision. At the age of 18 she announced her decision to became a missionary nun. Agnes took training in Sublin, Ireland as a missionary. There she took her first course in the English language. From that time on-wards she used the name Teresa. In the view of her trainers she was not outstanding. She was shy and hardworking. But she possessed a charming personality for which everyone liked her. On December 1, 1928 Mother Teresa and her friend Betika came to Darjeeling. There she took training at the Loreto convent. After two years of intensive study of Loreto history, prayer and mission work, she took her first vows-promising to live a life of poverty, chastity, and obedience and was ready to teach at the convent and assisted the nurses in a Bengali hospital. For the first time she came face-to-face with the relentless human suffering, she had heard and read about. Then she came to Calcutta to teach Geography and History at St. Mary’s school. Subsequently she was appointed heard of that institution. From then on, she would be known as Mother Teresa. At that time Calcutta was full of slums. The life in the slums was not decent. People were dying there for want of food, medicine, care and money. They were poor folk. They couldn’t afford a square meal for the day leave aside medicines? Mother Teresa heard the voice of God who told her to serve those sick and poor people. The actual life of Mother Teresa began. Catholia Church brought a residential home whose address was 54A Lower Circular Road. From this home Mother Teresa started her mission. Soon this home became famous in India and eventually around the world. Hers was a life of duty. One by one she founded numerous destitute homes for the poor, the orphans, the sick and the dying. Her charitable homes extended beyond Calcutta. She even opened Shanti Nagar, a home for the lepers. She was not afraid to treat leprosy-patients. She was engaged 24 hours a day in the service of the suffering humanity. Still she had always a smile on her lips “Smiling”. Mother Teresa said, is the beginning of love”. News of Mother Teresa’s amazing success spread beyond India to the rest of the world. Nuns from the other cities joined her order and under her direction opened houses in Europe and the United States. She established treatment centres for hug addicts and alcoholics too. In the 1980s more houses opened in Europe, Africa, the United States, and South America. Time magazine called Mother Teresa “a messenger of love” and gave its readers a glimpse into the life of a living saint”. As she aged, she suffered from heart aliments which slowed down her work. In spite of her heart attack in 1983. Mother Teresa kept on working and traveling. On October 24, 1985 at the age of 75, she was honoured speaker at the 40th anniversary of the United Nations in New York. Where Secretary General Javier Cucllar introduced her as “the most powerful women in the world”. The Govt. 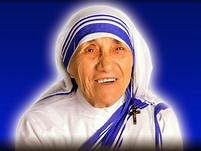 of India honoured Mother Teresa by bestowing on her the highest civilian award “Bharata Ratna” . In 1979 the world honoured her with Nobel Prize for peace. But prizes can’t evaluate her extraordinary personality. She was actually an angel in flesh and blood. She left for heaven on 5t September, 1997 leaving millions of destitute crying “O Mother! O Mother!”.